Published: Nov 16, 2007 to ? 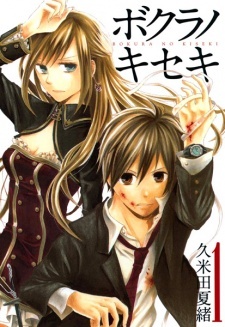 The original pilot one-shot of Bokura no Kiseki was published in Zero-Sum WARD Vol.18 on November 16, 2007; it was renamed to chapter 0 in the first published volume. Serialization started in Zero-Sum Ward No.005 on September 16, 2008, which continued until its discontinuance in May 2015 (2015 No.045). It re-started in Comic ZERO-SUM on August 28 (2015-10 issue). The series has been published in Polish by Waneko since May 18, 2016. When one sees the shojo label on this they may be scared, but the truth is, its quite the opposite. Although it can be considered shojo, it is completely different and unique and presented in a refreshing way that anyone a fan of shonen or even seinens can appreciate. The tale is relatively unique, however not completely new. The main protagonist is a male by the name of Inami Harusumi, who has the mind of a princess named Veronica, from hundreds of years ago. After an incident at school and happily getting with the girl he liked an incident occured and several of his classmates ended up getting the memories of other important people to the princess. This manga, in my opinion can be quite confusing so its important to read it slowly I usually read manga extremely fast but this one I found myself having to read over specific parts. The romance aside from the historical point of view is another major aspect of the manga, it isnt cliche or isnt presented in a typical shojo manner at all. It isnt super fluffy or vanilla, but you still find yourself smiling after you see something heartwarming and wonder is it possible our male protagonist will choose this girl despite his crush. All in all this is a rather more mature shojo and requires you to read carefully at times to pick out details, especially since personalities change alot from to past to present. Anyone looking for romance and something with a relatively cool concept should check this out. This is an amazing manga and definitely a hidden gem. Anyone who loves a good plot should read it! Heck, anyone should read it! It's that good. The plot is great. It's solid and very well-crafted. There are tons of unexpected twists and the story just keeps pulling you along for the ride. Little nuances you wouldn't notice in the beginning pop up later to have meaning. There's plenty of action. The magic in this story is pretty cool. Romance doesn't play that big of a role, so don't expect a bunch of fluff scenes. Art is enjoyable to look at, but some characters look very similar. It takes a while to identify who's who (other than the main characters) and even then, sometimes you still can't. Great characters! The main character and other important ones are all quite likable. No shallow characters. Everyone has a pretty solid personality and there's definitely character development. This was a great manga. The plot, the characters, and everything came together very well. The plot especially made the manga very enjoyable. It's different from the shoujo mangas that just follow the character's daily and dramatic lives, or the shonen mangas where characters just keep battling each other and nearing death. Bokura no Kiseki asks a simple question, "If you had been reincarnated, and you could find out about your past, how much and why would you want to know?" The questions later pile on--"If you held certain power in your hands, what would you do with it?" The story starts off rather peculiarly. A young man, Minami Harasumi, strangely relates to a princess from the Middle Ages--Princess Veronica of Zerestria--and he himself is certain that he is the princess in reincarnation. Peculiar. But it doesn't stop there. While he is the only one who believes he is a reincarnation at first, others in his highschool--many who had once scorned him for his "fantasy--" begin to remember their past lives as well. Wars from the past reincarnate as well, through the form of the numerous students who remember their allegiances and seek rashly the answers to the wars of the past. As the students and Harasumi himself begin to question the motives of their past selves innocent lives are hurt and moral issues are thrown into play. Overall an excellently developed plot, while being slightly confusing at first the plot does begin to be more and more understandable as one progresses reading this manga. The art does quite resemble Reimei no Arcana to a large degree, the eyes, the styles of hair--makes you wonder if the artists are the same. Needless, the art is pleasing to the eye. The only one thing to note about the art is that often times it can be quite confusing to tell one character from the next. Often times I could scarce tell the difference between Haruko and Maki save for a slight difference in the way they braid their hair. But other than that wonderful art overall. The main character Harasumi shows quite a bit of character development--as do all the characters on a whole--so it is easy to feel for their thoughts and understand them. As one reads, one begins to pity, to sympathize with some of the characters as they lament either the past deaths of loved ones or of their own actions of their lives in the past. But what is most appealing is that these characters, no matter what happens to them, stay true to themselves. They do not forget their roots, their backgrounds, and most of all themselves. Kudos to the author for these character designs, really loved them on the whole. If you are looking for an entertaining shoujo manga to read--look no further thou shoujo lovers/shounen lovers! This manga will satisfy any tastebud guaranteed! Especially if you do not read shoujo very often this is a great change of pace that you will find refreshing! There is enough action present for me to be on the tip of my seat and yet enough romance and slice of life for me to be in the feels half the time. And I don't get in the feels very often! 4.5 stars out of 5 for the wonderfully presented, manipulative, witty, and speculative Bokura no Kiseki! "Helpful" and "Not Helpful" voters alike, I would like to encourage you all to drop me a message, a comment on my profile perhaps regarding all comments questions or criticism you may have regarding my review! Any and all criticism is appreciated! It's been years since I have felt so compelled to write a review but this manga is nothing short of amazing. The one word that sums Bokura no Kiseki up perfectly is Solid. Although a boring word at first, not many series can pull off being such an enjoyable read whilst still maintaining such a high quality of thought, art, plot line and character development. The storyline is not something I have seen in many other series. It's an interesting blend of mystery, fantasy and action, all while taking place in the modern setting of a typical Japanese high school. It's also quite nice to see that despite having some elements of romance, the author does a good job of putting it on the back burner in favour of advancing the more meaty parts of the plot. Despite being a huge fan of romance myself, it's refreshing to read a series that doesn't prioritize romance like the usual manga or anime. Now as for the actually plot, despite the main setting taking place in a high school, students of a particular homeroom slowly begin to discover that they were all reincarnations of a group of people that once lived in the same castle, with the heads of the castle being Prince Eugene and Princess Veronica. After recollecting all their memories, they realize that their past lives all died due to a war between the Prince and Princess' peoples. Despite once being enemies, they begin to all work together to figure out exactly what happened in the past and who betrayed who. What really shines about this manga is the character development of both the main and supporting characters. Everybody first begins by being a joyful happy go lucky team of classmates but as the characters begin remembering moments from their past, you can see the great toll that it takes on them both mentally and emotionally, as it should. Many people who were once friends become enemies; happy people begin to become more somber like their old personalities; and feelings of loyalty, hatred, love, and admiration come out of no where. It's amazing to watch each character deal with this significant change and how they slowly learn to not ignore or succumb to their old personalities, but to coexist with them as a new person. What's amazing about this manga as well is how real each character is portrayed. Nobody is made out to be a martyr or a villain. They're just human; each character has their ups and downs, and their bad qualities along with their good. Paired with the plot of how the antagonist stays in the shadows the whole time, it makes discovering who the antagonist that much more thrilling. On top of that, the author has an amazing way of making the reader go on an utterly convincing goose hunt. Some characters that you once thought were good, you slowly begin to suspect. Other characters that you thought were definitely bad, are revealed to be good. Some that were good become bad and then good again and vice versa. It's absolutely amazing how intricate the plot is whist still being incredibly easy to understand. I can verify myself, as a certified idiot. There's not much to comment on the Art. It's very simple but still pleasing to the eye. Characters are easily differentiated from one another, despite the author making fun of how confusion would arise if the characters were to get a hair cut. But otherwise, the art is a great compliment to the amazing plot and even more amazing characters. Although I'm not a huge fan of fantasy, I have no regrets picking this manga up. It was a thrilling adventure for my mind to follow and it's a read that I highly, highly recommend.